Cooking green beans could not be easier. Cooking green beans is a cinch, but first, if you want them really delicious and healthy, then think about growing them too. They are the simplest veg to grow. You put a seed in the ground and come back six weeks later, and hey presto, you have a mountain of fruit. Not many things more rewarding that picking the fruit of all your labour. 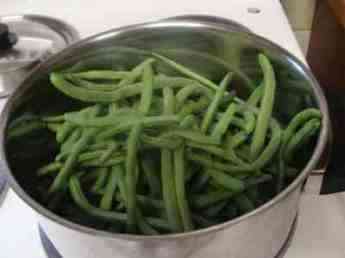 In ten minutes, having top and tailed 'em, you'll be cooking green beans; from your very own garden. Pour a small amount of boiling water into a pot, perhaps half a centimetre deep, bring the water hard to the boil again, and toss in the whole pole beans and put the lid on. Assuming they are nice and young, about two minutes of hard boiling is enough. Turn the stove off, they'll go on cooking for another five minutes. Drain, retaining some of the water. This page was last updated by Bernard Preston on 7th April, 2019. 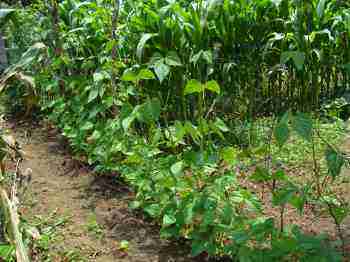 Bush beans have the advantage in that they are quick. You'll have a crop in about six weeks. So, they are the choice way of growing them in early spring after all danger of frost is over. For me, rather though I'll grow pole beans. Or, as we call them in Africa, climbing beans. You'd be astonished at the crop you'll get off just three or four poles. Not enough for a green bean casserole, three bean salad recipe, bean dip recipe and the like, but sufficient for one person. 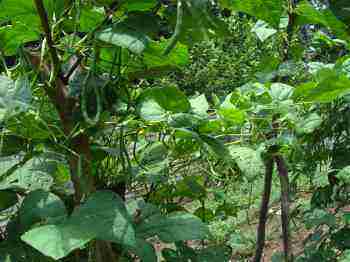 Pole beans bear much longer too, and if you get unexpected heavy rain they don't get mildew. Just plant two or three seeds every week. But for our family, I plant three times, perhaps fifty beans at a time on a homemade trellis. We eat them morning, noon and night through the summer. They are staple in our lives in an attempt to reduce our need for red meat for protein. 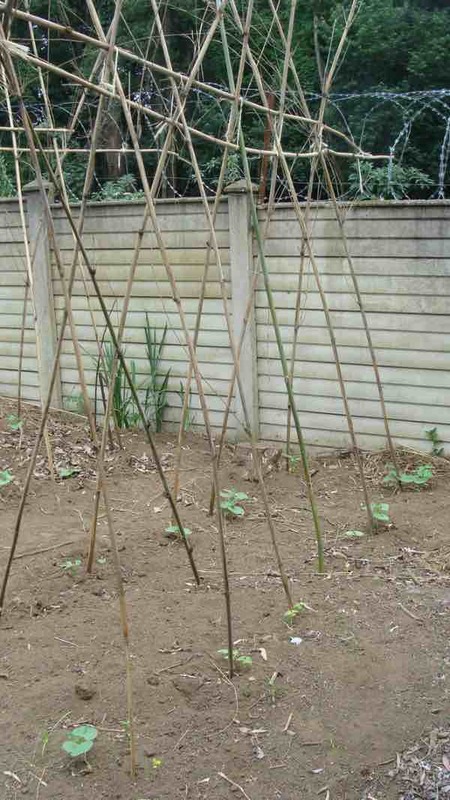 You need either a fence or three poles in the ground, as in a teepee; we now turn it into a trellis. Pole beans grow tall, so preferably more than six feet high. Beans are tremendous food, rich in protein and carbohydrate, but to get full value, you need some compost. Preferably quite a lot. Start by digging a shallow trench and filling it with whatever humus you have. First prize, if you have the space, is making a compost pile for yourself but growing beans don't really require well rotted compost; actually now we use kitchen waste that has been processed by a worm farm. They're not fussy, but if you want quality beans, find or make the compost. It's good for the environment too if you can use all your kitchen waste in the garden. Potato and banana peels, uncooked eggshells, beet skins, old flowers, and grass cuttings are perfect; all the organic material. 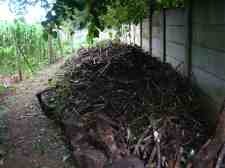 No cooked food though should go in the compost heap; put that into the worm farm. If you haven't started one, now is the time; it means no food for rats, plenty of liquid manure and a surplus of creepy crawlies for your garden and, if you keep them, the hens. 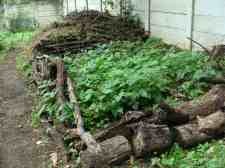 Some of the best compost comes from decomposed logs, only it takes longer. 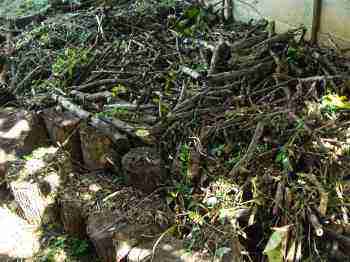 Here's a giant pile of sticks that has come out of the jungle, that was formerly my apiary. I must have bees again, so instead of burning these sticks, we'll compost them; the earthworms love them. In case you are unsure, beans are legumes, full of vegetable protein; that means less red meat. I'm sure you know that processed meat like bacon is definitely only for high and holy days, if then and the WHO says that even straight red meat is 'probably' cancer causing. Certainly no more than once a day, and preferably only a few times a week. What are legumes is the alternative. Growing green beans is just as easy as cooking them. Our hens have latterly contributed enormously to our eco garden, providing manure and sorting out the beetles. But beware, the birds need large amounts of protein for your eggs; they'll demolish your veggies without a chicken tractor of some sort, or protection with a vegetable garden fence. Whilst in the early days I was hot on a Chicken tractor design I now allow the birds to roam freely with little cages around the sensitive seedlings. Free range eggs are a must in our home for the choline and rich bright yellow yolks. Making a compost pile for yourself. Cover the compost with a few inches of soil and then make a drill about a centimetre deep. 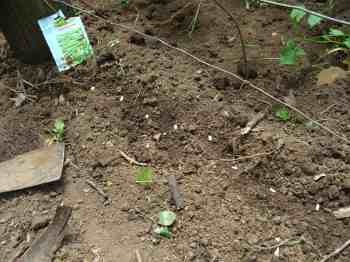 Plant the seeds about 6" apart and cover with fine soil. Growing green beans are very hardy, the roots go deep into the ground, so you don't have to fuss if you have a dry period. Water obviously if it gets really dry, particularly around flowering time. The other advantage of pole beans is that they are so easy to pick. With bush beans, you might require a couple visits to your chiropractor after all the bending! An aside: Whether you grow bush or pole beans, or get them from the supermarket, think about these lower back exercises. I've just seen this 82-year old lady. She came four months ago with severe pain down the front of her left leg. 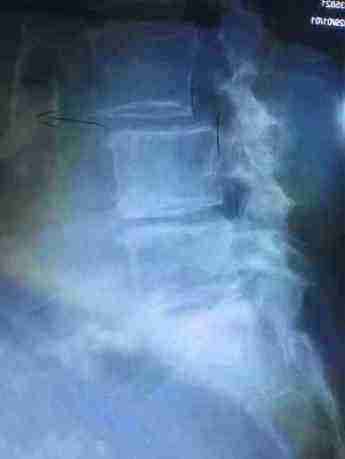 A pinched nerve in the midlumbar region - can you see where the vertebra has slid forwards? That's called a 'spondylolysthesis'. Long word! Lumbar facet arthropathy causing a spondylolysthesis is the name of this jaw breaker. She's doing these lower back exercises very faithfully she tells me. She can even garden a bit, though I'd rather she grew pole than bush beans. 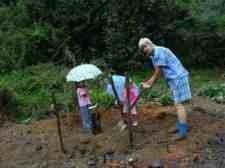 And I asked her grandson to dig the trench for the compost. Now that's hard work; but if I can do it at 70, you could too. It might bring your Chiropractor some business if you're eighty-two! That's assuming you're doing these lower back exercises every morning before getting out of bed. I do, and I still need the odd Chiropractic adjustment from my daughter. It's nice to have it in the family. Lower back exercises done faithfully every morning before arising are the secret to success with lumbago; they take less than two minutes and are a whole lot better than lower back surgery. And you thought this page was going to be all about cooking green beans. Not so, that's easy-peasy, but growing green beans and then steaming them ten minutes after you've picked them, that's first prize. Best of all, after all the years of hard work, a long retirement is deserved, but has to be earned. Plenty of exercise and a lowish carbohydrate diet is an important part of the deal; less than say 100g per day. Half of that if you are diabetic. This is how your growing green beans will look after about six weeks. 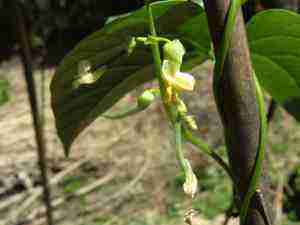 Shooting up like Jack in the Beanstalks, and very soon the first flowers will be appearing. Those are maize plants in the background. And a few weeds need my attention. Last year our beans were hit hard by stink bugs that stung the fruit. They are sap sucking insects; this year I'm going to try using this homemade product from white oil manufacturers that we make up; you don't need to buy it. 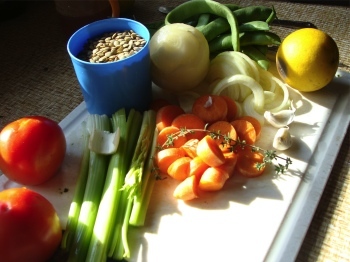 In your mind's eye, can you see a delicious healthy SUCCOTASH RECIPE on the table? Cooking green beans is a cinch. We do top them, but don't bother any more with tailing. If the rest of your supper's ready, scoop them straight onto the hot dinner plates. If your cholesterol is in shape, smother them with some fresh butter. Yum. But if your cholesterol's not in good shape don't take statins; there's no research showing they will add a day to your life unless you've already had a heart attack. Think rather of eating foods that will lower your cholesterol naturally. It works, dinkum. My cholesterol is 4.2, and just ask Helen, I eat far more butter than is supposedly good for one. But then I do enjoy Helen's 15 euro salad several times a week. And in the summer, I get plenty of practice at growing green beans. Both growing green beans (the exercise) and cooking green beans (and eating them) will keep your cholesterol profile in order. It's refined carbohydrate, not butter, that's the devil. Did you know that 120 years ago, the average person ate 4kg of sugar per year. And today it's over 50kg; there's the problem, along with cake flour and white rice. HELENS 15 EURO SALAD ... constipation, diverticulosis, bowel cancer and much misery all prevented in one dish. Nitrogen fixation bacteria in the roots of legumes like green beans provide that vital element, for us and for all the other plants in the garden that like us are dependent on these bug for utilizing the gas from the air to synthesize protein. Our bodies require abundant amounts of nitrogen in our food to manufacture amino acids, the building blocks of living tissue. The beauty of legumes like growing lima beans in our gardens is that they reduce our reliance on amino acids from red meat and dairy; there is now abundant evidence that animal protein eaten in excess, causes many malignant diseases, especially when processed. Research in Holland which has the highest rate of breast cancer in the world indicates that red meat, dairy and eggs, eaten in excess, are the main cause; and hormone replacement therapy. Could free range eggs be different? I think so, but I can find no research confirming it. Breast cancer and prevention should be on the agenda in every family; it doesn't just happen to other people. Mexican bean beetles are a serious impediment to your desire to grow and cook green beetles. One bug will lay over a million eggs turning into Mexican bean beetle larvae, bar those taken by ladybirds and white-eye birds. There are some green organic solutions, but it remains a serious pest. Another serious pest is your own chickens, if you have any. They desperately need vegetable protein to lay those lovely organic eggs. There are compromises and solutions if you want free range cage free eggs. They are loaded with omega-3, so desperately short in the average diet resulting in inflammation, pain, cancer and attention deficit. 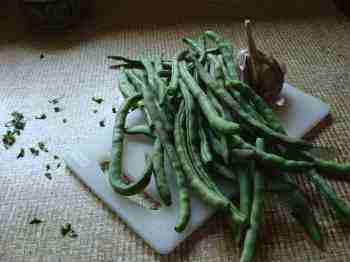 A green bean salad is my favourite way of enjoying this wonderful legume. It's also quick and easy. In five minutes after cooking green beans, your vegetable protein salad will be ready for the table. Perhaps less, believe you me, I'm the one who makes it! Well, sometimes! A good handful of raw green beans, depending on how many guests you have coming to lunch. One or two shallots, spring onions. Or just a few slices of an ordinary onion. Freshly squeezed juice of one lemon. One (or more) clove of garlic, freshly chopped. A good slosh of olive oil. Cooking green beans as above. Squeeze the lemon, pouring the juice into a glass bowl, together with a little of the water you cooked the beans in. Add your olive oil, S&P and mix it up. Toss in the chopped shallot and clove of garlic. Stir. Add the hot chopped, cooked green beans. Ladle the juice over the beans. PS: We need to educate our tongues to the fact that not everything must be sweet. But if you insist, add a teaspoon of raw honey. Make it pretty with some slices of tomato and a sprinkling of fresh parsley, and it's GRUB'S UP. Time permitting, it's good to wait for a while for the flavour of the garlic and herbs to permeate the beans. Update: I've been experimenting with a new herb to me; it's called sweet basil and you're probably familiar with it. 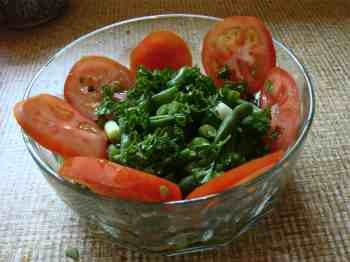 A few freshly chopped leaves in your cooking green beans salad make for a lovely change. Scroll down past making a correct diagnosis to sweet basil and how to make pesto. Making a correct diagnosis and the beauty of sweet basil. Three bean salad recipe means just adding half a can of baked beans, and another of butter beans. Another of our favourites is these green bean succotash recipes. It's really very simple when the corn is a little to mature to enjoy straight off the cob. Straight from the garden, like new potatoes, they don't cause a high glycemic response; read, they don't make you fat. Here's the rest of my lunch today. I always like to add a fat (like avocado, or fatty fish) to my bread because of bread's high glycemic index. Adding fat or protein, or something like hummus which has a very low glycemic index will reduce the insulin rush that just plain bread, white or brown, gives. It's soluble fibre that slows the absorption of sugars into the blood stream. Cooking green beans are full of fibre. A protein dish always adds to a salad, today it's just half a block of feta cheese. But perhaps a leg of free range chicken, or a few slices of mutton. What is mutton? 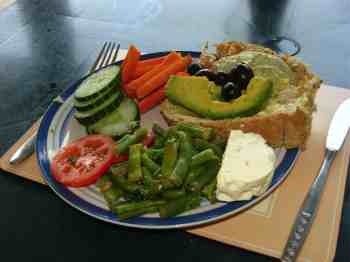 Anyway even if you have no desire to live to be a healthy ninety with all your marbles intact, MY LUNCH TASTES DIVINE! As we said in Holland, Eet smakelijk. Enjoy! Red meat max once a day remember, probably three times a week max... get more protein from legumes, fish and fowl. Phytochemical foods keep the big C at bay and mostly they are delicious; lightly cooking green beans is important; they are heat labile. Beans too contain a wide array of the plant chemicals that are known to have a vital function in health; but because there are thousands of them, scientists have only begun to scratch the surface. They make up the colouring in green beans, known as flavonoids, and it's now known that they have an important role preventing the absorption of cholesterol from the gut, for example. They are the reason why we should be eating a minimum of five coloured foods each day; I aim for ten, if in small quantities. A sprig of parsley might count for one. They have an antioxidant and anti inflammatory effect in the body. If you're interest, read up more about phytochemical foods. The flavonoids in beans, the lignans in flaxseed, the stanols in avodcados and olives, the terpenes, the cartonenoids, the indoles and so on; thousands of them. Make sure you are getting as many as possible by eating from a wide array of foods. Meat and potatoes man? There's trouble coming. 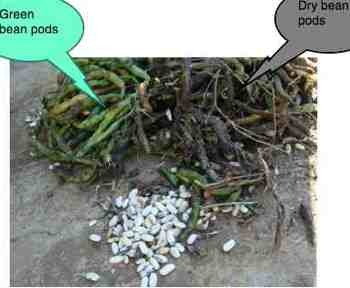 At the end of the summer you'll find that there are a few pods that you have missed. This is the time to SAVE BEAN SEED for next year's crop. Save time, save money, save the planet, keep your own seed. Food lover? Then you absolutely must have a lemon tree in the garden. The Meyer lemon is the most beautiful small tree, with bright yellow fruit, scent in the Spring that is divine, and lemon juice oddly is one of the few fruits that, despite the citric acid, actually acts as an alkalising agent in the body. Taste fantastic, looks beautiful, is healthy, what more do you want? Essential for COOKING GREEN BEANS. I've just planted my first lime tree, even nicer that the lemon my brother tells me. Growing lemon trees isn't difficult. Few things go better with a salad than a roll with a delic dip. Try this cream cheese dip for example, and olive pate. GREEN BEAN AND LENTIL SOUP was good enough for Andre Agassi before a match, and it's good enough for me! Dips made with cream cheese are great unless you're allergic to dairy. 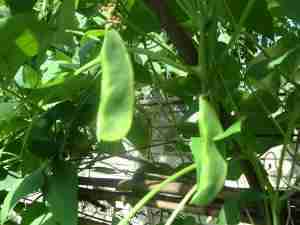 Another wonderful plant protein can be obtained from the lima bean. 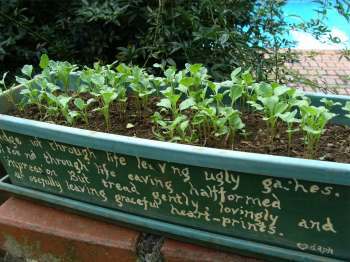 It's not a legume that you'll find fresh in your green grocer, so you'll have to grow it yourself. Sufferin' succotash, this is a marvellous bean. Quite a lot of PT unfortunately, but so rewarding, if anything even nicer than pole beans. GROWING LIMA BEANS on a vegetable garden trellis is one of my favourites; it's now late summer and we are enjoying the first fruits. The glycemic response to legumes, with the exception of broad beans, is very low by the way; they don't make you fat. The latter are a must because of their prevention of Parkinson's disease, but must be enjoyed in the context of the whole meal, rich in fibre, other protein and some fat all of which the rapid digestion of the starch in the small intestine. Apologies if you are hunting for green bean cassarole and three bean salad recipe - a page for next summer when we have more cooking green beans. Midwinter now in the southern hemisphere. More about green beans at World's Healthiest Foods. A DAY IN THE LIFE OF CHIROPRACTOR BERNARD PRESTON makes me dizzy on reflection; goodness how busy I was before going into semi-retirement; now I have time to focus on my hobbies and particularly backyard permaculture and healthy living. A life without medication is truly one of the great blessings, but comes only to those who have made a commitment to plenty of exercise and good food like cooking green beans. Getting most of our protein from legumes like green beans gives us a greater chance of enjoying a life without medication. Potatoes love compost. We dug up to 14 potatoes per plant. 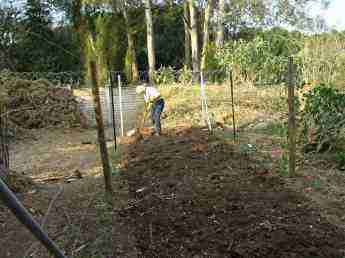 Green beans, peas and butternut will be planted along the fences.